Something about watching Miguel Gomes’s Arabian Nights recalls the sensation sparked by Guy Maddin’s The Forbidden Room: of diving headfirst into a dream-pool—not sure where the bottom is—into a huge messy concatenation of styles and ideas and half-finished stories about something. The film is a six-and-a-half-hour remix of the magical and the real, in service of the political. It isn’t coherent, and it isn’t always good, but it can be fascinating. On-screen text at the start of each installment (it’s being released theatrically as three “volumes,” each just over two hours long) tells us that the film borrows on the skeleton of The Arabian Nights, but the flesh and muscle are comprised of vignettes about the difficulties of impoverished, ordinary Portuguese after European austerity measures taken in 2013 and 2014. (Portugal was hit hard by the general European economic downturn, surpassed only by Greece.) Here, the framing device is proffered by the filmmaker himself, begging for his life from his angered, unpaid crew—but that gives way quickly to Scheherazade (Crista Alfaiate) as narrator, or mouthpiece. As with its ostensible source material, folk stories and characters migrate across genres and time zones, the ancient and the new getting muddled. Time, the film seems to say, is more of a loop than a line: Everything new is old again. 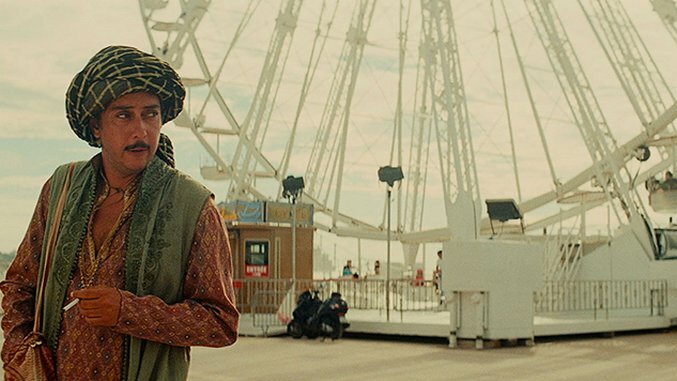 Arabian Nights functions as a protest film, mostly through metaphor. Its most comic segment (“The Men With Hard-Ons”) recasts the genesis of the problem as a heady cocktail of bankers’ and leaders’ machismo and weakness. Throughout the film, stories that seem quite real—in Volume 2, a dog gets lost in a housing complex; a village discovers how interconnected its fates are—mingle with some that actually are real—protest footage; a long section in Volume 3 about men who raise finches competitively—and some that are completely fantastical. Scheherazade herself shows up, as does the filmmaker. We get halfway through a story and it turns into another. Gomes sent a team of journalists out to collect narratives and then determine which of them would be used for the film. This results in a certain banality to some of the stories, especially those told by non-actors, about the results of the economic downturn on their own lives—disappearing employment, difficulty with bills, diminishing social services. A recurring visual and narrative motif involves swarms of bees and flocks of birds, echoed in the man-made hives of public housing. All of these groups can be eliminated or hampered by various sorts of blight, which Gomes is clearly suggesting parallels the country’s austerity measures. Unfortunately, all these big ideas, thematic experiments, and shifting tones and styles are crammed into a container that’s not really big enough to hold them. At this length, the spillage is less delightfully playful and more superfluous fat that needed gentle editing. After all that time, you want something to grab; what you get is a disjointed recollection of bits and pieces, which seems less productive politically than Gomes intends it to be. But there’s an advantage to the sheer length of the film when taken as protest, which is that it forces you to dwell with the banality and meditate upon it. Sometimes the story being told doesn’t match the story—a love story narrated over images of protest—and the ordinariness lingers as an uncomfortable haze over some of the sunnier, more sumptuous bits. Of course the original Arabian Nights was a desperate attempt by a queen with her life on the line to make time stretch out and to save her own skin, and Gomes never really returns to the embattled filmmaker, which gives the impression that he plans to still be out there telling stories for a long while, begging for his life. Everyone in the film is telling stories, too, trying to make sense of the chaos. So while it doesn’t quite satisfy as a film, Arabian Nights is successful as an extended contemplation of how not just people’s lives, but their futures, depend on one another as much as the past and the future. Without telling those stories, austerity and the economic downturn that preceded it are just a bunch of abstractions against which the bankers and the officials can exercise their wills. Alissa Wilkinson is chief film critic at Christianity Today and an assistant professor at The King’s College in New York City. Her writing appears at Vulture, The Washington Post, The Atlantic, The LA Review of Books, Pacific Standard, and others. Follow her on Twitter.